The Bicycle Forest had grown to the point where we felt it was time to invest in a vehicle that we could use to get the message out about our BikeCAD bicycle design software and the wide array of specialty bicycles that we have available for rent. Although we don't believe in psychoanalyzing people based on what vehicles they may or may not drive, we do believe that when a corporation selects a car or truck for promotional purposes, it is vital that it select a vehicle that captures the personality and spirit of the company. Of course, the first vehicle that came to mind for us was the Hummer by General Motors. 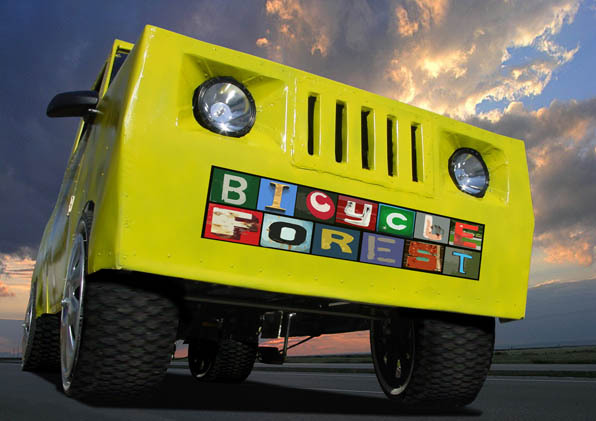 The enormous body panels would serve as moving billboards, brandishing the Bicycle Forest logo wherever we go. We found the possibility of winning customer support through vehicular intimidation particularly alluring. Furthermore, the opportunity to associate ourselves with the military industrial complex made the Hummer an obvious choice for the Bicycle Forest. Admittedly, the 16" of ground clearance and the Hummer's water fording capabilities had us wondering if we'd be paying for features that we don't really need. Then, we learned that the Hummer has a curb weight of 8114 lbs. "Who were we kidding?" we thought. Obviously, we'd be paying for thousands of pounds more than we'd ever need. Clearly, our decision to purchase a Hummer would not be based on practicality. It would be to make a statement about our dominance in the bicycle design software and bicycle rental industries. It only seemed fitting that we should dominate the highways and byways of North America with the same might that we exert in our own business. Unfortunately, once we learned of the Hummer's abysmal fuel economy, we simply could not reconcile owning such a vehicle with our concern for the environment. We examined several other options. Some had exhaust that smelled like french fries, others had no emissions at all. We particularly liked the idea of a zero emissions vehicle, until we found that most of these cars ran on electricity or hydrogen. 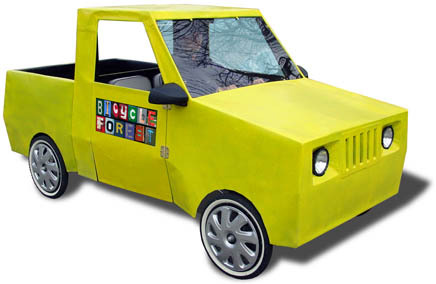 Although we applaud the development of all forms of alternative energy vehicles, and we are happy to see electricity being generated by more environmentally friendly means, we weren't thrilled about the idea of creating even more demand for electricity with the purchase of our Bicycle Forest promotional vehicle. The zero emissions vehicle that most impressed us was the Rhoades Car. Equipped with a butterfly steering wheel, marine grade vinyl seats and molded black mag wheels, the Rhoades Car is the most well appointed car in its class. By eliminating the engine, the automotive engineers at Rhoades Car have created the most fuel efficient car in America. The only drawback is the top end speed. The Rhoades Car is not fast enough for freeway travel. We've come to accept this limitation. At the Bicycle Forest, we believe that in addition to making our existing modes of transportation more environmentally friendly, we must also strive to change our transportation patterns by driving less and using more public transportation. By adopting the Rhoades Car as our official company vehicle, we feel that we are doing our part by not only driving an environmentally friendly vehicle, but also by scaling back on driving in general. If there was anything about the Rhoades Car that didn't entirely suit our corporate image it may be its lack of rugged styling. Although we are not farmers, or heavy machinery maintenance workers, we very much wanted to associate our image with that of these hard working people. That's why we decided to Pimp our Rhoades Car. 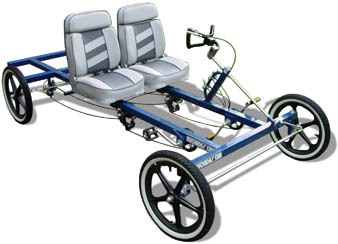 To supe up our two passenger, long frame Rhoades Car, we started by welding together a chromoly steel frame in the style of a pickup truck and wrapping it with 30 gauge galvanized steel. We painted it John Deere yellow and mounted a plexiglass windshield, 55W head lights, LED tail lights and rear view mirrors. The finishing touch was a set of aftermarket hubcaps. The pimp job added an extra 138 lbs to the car, but it was definitely worth it because now we can send the same message that other corporations have sent with their promotional Hummers. "We're the Bicycle Forest, and nobody messes with us!" Here is a public service announcement featuring the converted Rhoades Car.